We’ll start with the chicken, because it takes longer — the salad is pretty much chop-and-mix! A note about the heat level in this recipe: If you are not a fan of spiciness in your food, you can certainly tone it down a bit by using a less-intense pepper, but personally I think some of its charm comes from the contrasting heat and coolness in the two recipes playing off of each other. The original actually suggested 6 (SIX!!) Scotch Bonnet peppers. 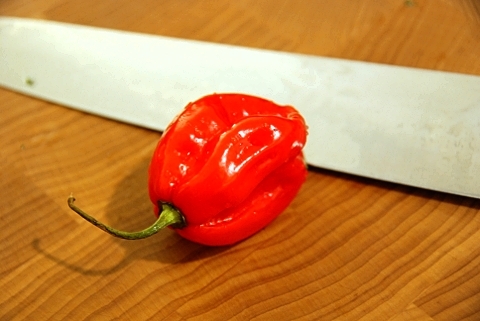 A single Scotch Bonnet pepper ranks at 100,000-350,000 on the Scoville scale — in comparison, a single jalapeño ranks around 2,500-8,000. Using six in this recipe probably would have killed me, so we ended up toning it down to a single habanero, which neither of us had actually used before (ranks around the same as one Scotch Bonnet, actually, but easier to find). We started with prepping and sautéeing the chicken, since some of the veggies are a bit delicate. Heat up some olive oil and get the chicken mostly-to-entirely cooked, and then set it aside. While the chicken is cooking, prepare your veggies. 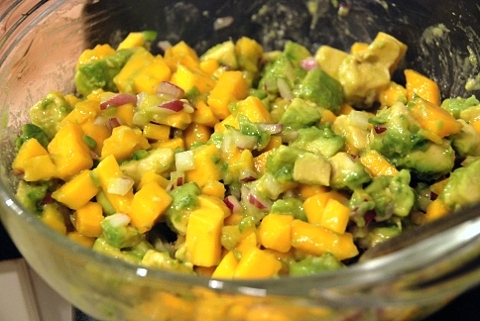 You can lump together most of them — keep the mango and the mint separate, but everything else can just go into a bowl. Heat up the olive oil and add that whole bowl of veggies and herbs (remember, this does not include the mango or mint!). 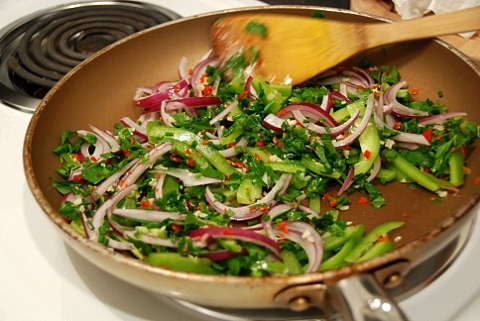 Cook these veggies for about 5-7 minutes, until the pepper and onion have softened a bit. 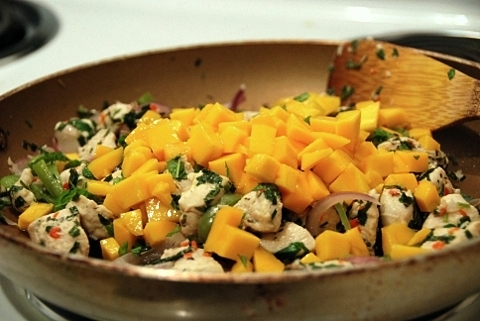 Add the chicken, mango, and mint, and cook for another few minutes, to warm everything up and let the mango and mint flavors get distributed through the other veggies. Don’t overdo it here, since mint can get kind of unpleasantly wilted if it’s cooked for too long, and the mango will get too mushy. Keep this warm while you work on the salad! Again, this is very straightforward. 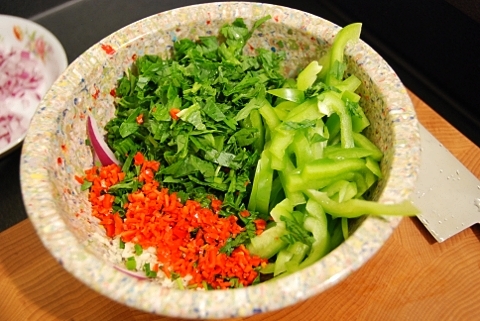 Prepare all your veggies, and then mix all ingredients together in a large bowl. Season to taste. 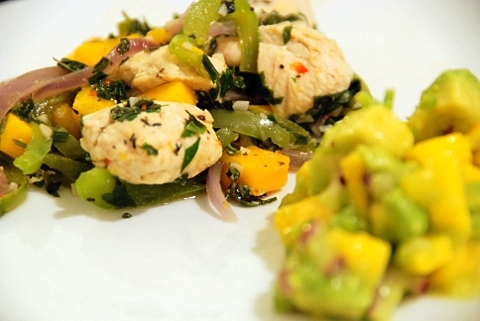 Serve some of the chicken with the salad on the side — the flavors really play off each other beautifully, and the mangoes in both recipes kind of tie them together for a lovely tropical experience! 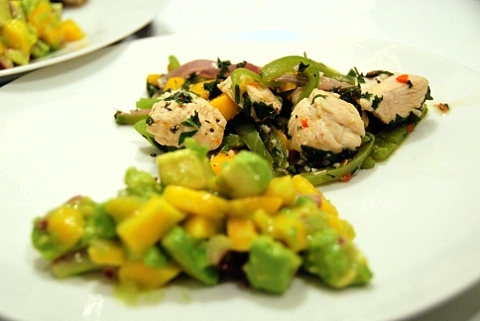 You are currently reading Sandy Island Chicken + Spicy Mango and Avocado Salad (Antigua & Barbuda) at Nombudsman.